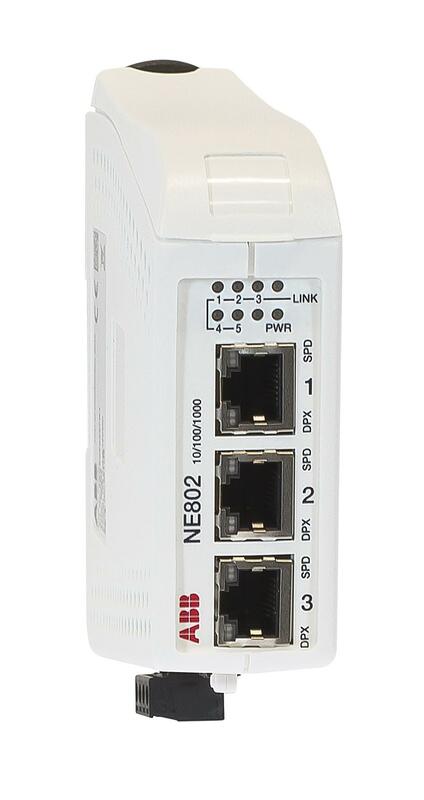 NE802 is an unmanaged 5-port switch with one SFP fibre port and four copper ports, all supporting 10/100 Mbit/s or Gbit Ethernet. The ABB range of Small Form-factor Pluggable (SFP) transceivers are available as multimode, singlemode or Bi-Di transceivers with distance up to 120 km. The unit is designed for use in industrial applications with dual 10 to 57 VDC power input. The unique “tri-galvanic” isolation provides isolation between all ports, power supply and between each chassis screen avoiding ground loop currents. The IP21 rating ensures that the unit can be installed in locations where condensed water may occur. Only industrial grade components are used which gives the units an MTBF of 1.182.000 hours and ensures a long service life. A wide operating temperature range of –40 to +70 °C (–40 to +158 °F) can be achieved with no moving parts.